James (Jim) Latimer was teaching a clinic on Sound-Music-Percussion at the Wisconsin Percussive Arts Society’s annual Days of Percussion event Jan. 27 at Wisconsin Lutheran College in Milwaukee when he began to get a little suspicious. The Wisconsin Days of Percussion is an annual event that showcases the diversity of percussion including drum set, Brazilian drumming, marching percussion, orchestral percussion, timpani, cajon, keyboard percussion sight reading, drum circle, and much more. The event, which Latimer has helped host in Madison in the past, typically includes multiple performances, clinics, and presentations. 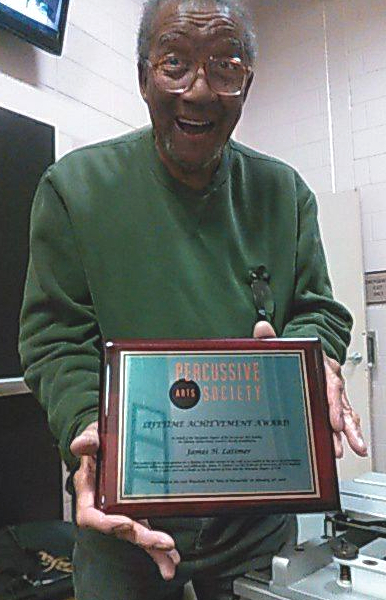 Latimer was awarded the lifetime achievement award for a lifetime of education, performance, and promotion of percussion as a solo and ensemble art form. Among the greats with whom Latimer worked with over his long career include Duke Ellington, Alan Dawson, Max Roach, William Kraft, Paul Price, Paul Creston, Sarah Caldwell (Boston Ballet) and Arthur Fiedler. Latimer also recorded with Fiedler and the Boston Pops Orchestra. James Latimer directs the Capitol City Band at one of the free summer concerts. Latimer may be getting up in years, but he’s still as interested in percussion as ever. “I was practicing just a few minutes ago,” he says. “It’s my daily routine. I’m still going strong. Latimer has had that same musical influence on young people for multiple generations. His students have gone on to be deans and professors of music at prestigious institutions, performers in professional orchestras, bands and chamber groups, as well as authors, composers, physicians and successful business leaders. 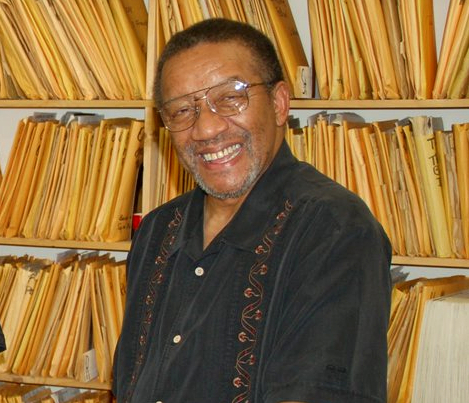 Latimer has devoted his life to taking music to the people of the Madison and beyond. On top of everything already mentioned in this article, Latimer is the founder and performing member of the 35-year-old Madison Marimba Quartet and is the conductor of one of Wisconsin’s finest professional concert bands, the Capitol City Band. Latimer also conducts Madison’s oldest volunteer community band, which gives musicians of any age a place to play and presents public-service concerts in nursing homes, health care and retirement centers, senior centers, hospitals and for veterans’ services. Latimer has also been recognized for his humanitarian service through Rotary International, United Way, and the University of Wisconsin. Now, he can add the Wisconsin Percussive Arts Society’s Lifetime Achievement Award to his impressive list of accolades.